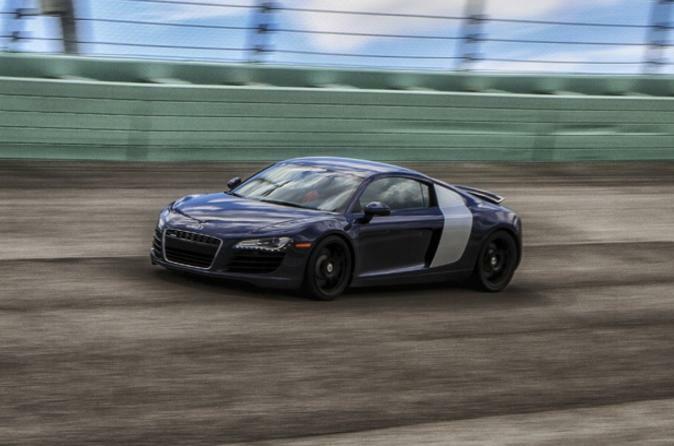 This once-in-a-lifetime exotic auto racing experience in Miami lets you get behind the wheel of two of your dream cars! Choose two cars to drive -- an Audi, Lamborghini or Ferrari -- and race six laps around a professional racetrack at top speeds. Feel your adrenaline pump as you conquer lap after lap in the driver’s seat, just like the pros, and receive side-by-side coaching from a professional racing instructor. Your Miami exotic auto racing experience takes place at the Homestead-Miami Speedway. When you arrive, meet your professional racing instructors and choose two cars to drive: an Audi R8, Lamborghini Gallardo or Ferrari F430. You’ll receive a 30-minute safety orientation, followed by a two-lap test ride in a demonstration vehicle to get you comfortable on the track.Then, it's your turn to hop in the driver’s seat of your first vehicle and rev up your engine! A professional racing instructor will be in the passenger’s seat to provide side-by-side instruction and encourage you to push yourself throughout your ride. Your instructor has at least 20 years of experience in Indy car racing, Grand Am racing or Touring car racing, so you’re in good hands.